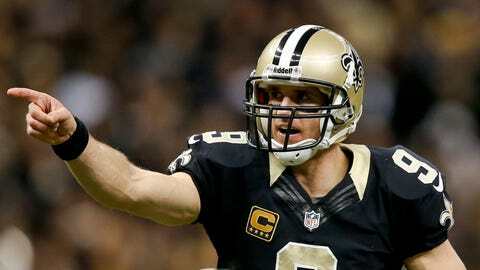 Drew Brees isn't slowing down in his 13th season. ST. LOUIS — The St. Louis Rams have to be happy to be home. After back-to-back losses on the road in San Francisco and Arizona the past two weeks, the Rams find themselves three games under .500 at 5-8 with three games remaining — including home contests with New Orleans and Tampa Bay. The Saints (10-3) come to the Edward Jones Dome as the No. 1 team in the NFC South and looking to stay sharp on their way to the playoffs. The Rams? Well, the playoff talk and hopes of a winning season will have to wait until 2014. But that doesn’t mean St. Louis can’t play spoiler the next three weeks while players try to state their case for a spot on next season’s roster. The Rams’ defense has a huge challenge on its hands Sunday — trying to slow down Drew Brees and one of the best offenses in the league. New Orleans ranks second in the league in passing yards per game (302.9) and passing touchdowns (33), fifth in yards per game (407.3) and is tied for seventh in points per game (26.4). Brees isn’t slowing down in his 13th season. He’s still at the top of his game. He has completed 68 percent of his passes for 4,107 yards, with 33 touchdowns and eight interceptions, and his 106.5 passer rating is his third-best mark. The Rams have struggled to defend the pass for much of the season. They are allowing 248.8 yards passing per game, which ranks 22nd in the league, and could go into Sunday’s game without one of their starting cornerbacks. Janoris Jenkins, who has started every game this season and leads the team with 13 pass breakups, did not practice Wednesday, Thursday or Friday because of a back injury and is listed as questionable. Rookie running back Zac Stacy needs 279 yards rushing over the final three weeks to hit the 1,000-yard mark. The Rams have had a 1,000-yard rusher in each of the past eight seasons, the best mark in the NFL, thanks to workhorse Steven Jackson. Stacy, the fifth-round pick out of Vanderbilt, is second among NFL rookies with 721 yards — trailing only Green Bay’s Eddie Lacy — and has scored five touchdowns. Stacy needs to average 93 yards per game over the final three weeks to reach 1,000 yards, and he’s been held under that mark in each of the past four games. He had 62 yards on 26 carries against the Colts, 87 yards on 12 attempts against the Bears, 72 yards on 19 carries at San Francisco and 25 yards on 14 attempts at Arizona. The Saints rank 18th in the NFL in rushing yards allowed (114.3 per game) and haven’t allowed a 100-yard rusher in their past five contests. Rookie wide receiver Stedman Bailey made his first start last week and has impressed in limited action over the past five games. The Rams brought the third-round pick out of West Virginia along slowly this season, but Bailey had three catches for 46 yards in each of the past two weeks and has eight receptions for 123 yards over the past five games. Bailey figures to be a bigger factor in the offense this week because his college teammate, Tavon Austin, is questionable with an ankle injury and hasn’t been able to practice all week. It’s a small sample size, of course, but Bailey has established himself as a reliable target for Kellen Clemens, catching eight of the 11 passes thrown his way. If Austin is out or limited, Bailey could see more opportunities in the passing game, along with Chris Givens, Jared Cook, Austin Pettis and Brian Quick.